NTC Commander Brig. Gen. Jeff Broadwater and Pvt. Deadrick Person of the 2/11 Armored Cavalry Regiment attempt to Facetime Person’s family to share the moment they cut the Army Birthday cake June 14. 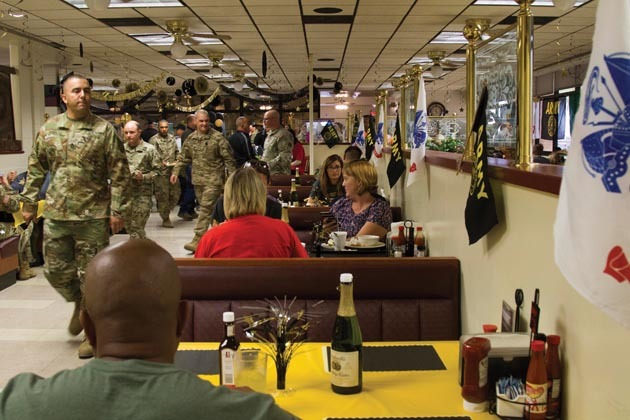 FORT IRWIN, Calif. — As Soldiers from the National Training Center pressed into Dining Facility #2 June 14 to witness the cutting of the ceremonial Army Birthday cake, Commanding General Brig. Gen. Jeff Broadwater called the installation’s youngest service member to the front of the room. He asked the Soldier, Pvt. 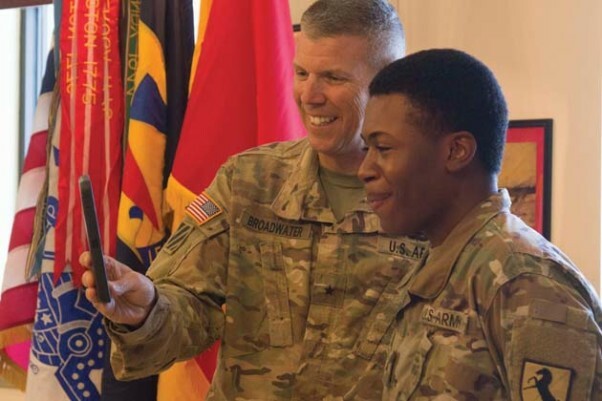 Deadrick Person of the 2/11 Armored Cavalry Regiment, if they might FaceTime Person’s family in Mississippi to share the birthday cheer. It took several attempts – and a good deal of hilarity – but the pair finally got Person’s mother on the phone. 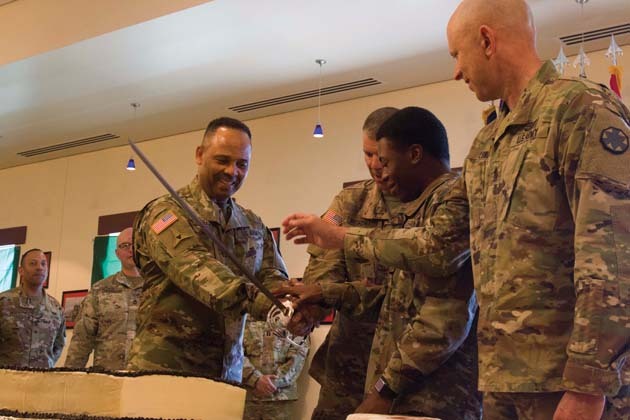 It was a moment that captured both the monumental changes the U.S. Army has seen over its 243-year history and the enduring spirit that binds the institution together. Ten years ago, FaceTime didn’t exist. Rapidly evolving technology has changed more than the way we call home. It has also altered the way Soldiers train and fight. The NTC is constantly adapting to prepare the Army’s brigade combat teams to overcome the latest threats. Units training here, for example, must navigate everything from cyber attacks to insurgent forces that organize and fund operations using social media. But while the gear and tactics of today’s Army may be vastly different from those of the Continental Army in 1775, its fundamental values remain. “No matter when our nation needs us, we are part of making sure we are ready to do that,” said Broadwater. Another thing that hasn’t changed much? The trust and connection between Soldiers. Take away the smartphones at the NTC birthday celebration this year and it wouldn’t be difficult to imagine a similar scene happening during the Great War, or even the Revolution – Soldiers coming together to celebrate, to trade jokes, to pass on tradition. It’s something 1st Lt. Jose Martinez, of the 11th ACR’s Regimental Support Squadron, hopes will still be a vital part of the Army in another 243 years. “It’s the camaraderie. The esprit de corps. 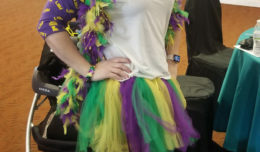 Events like this that bring us together,” he said. From left: WACH Commander Col. Larry O. France, NTC Commander Brig. Gen. Jeff Broadwater, Pvt. Deadrick Person and NTC Command Sgt. Maj. Matthew Lowe perform the honor of cutting the cake during the NTC’s celebration of the Army’s 243rd birthday June 14. 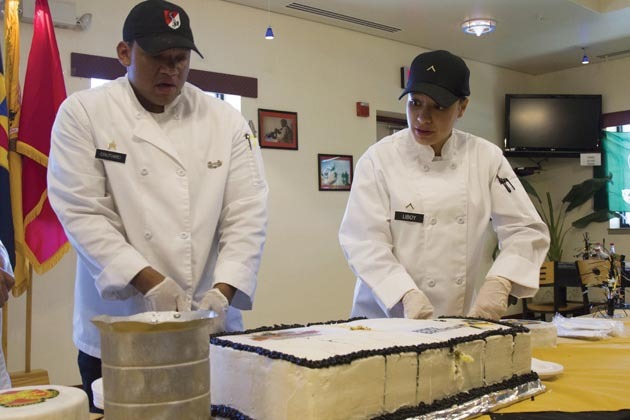 After the ceremonial cutting of the cake, the dining facility’s culinary team finished the job. 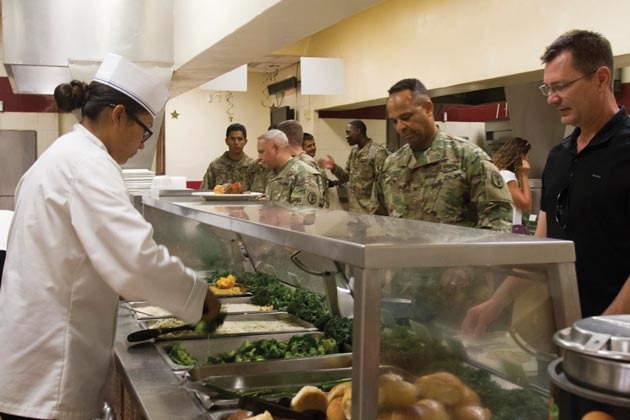 The National Training Center’s dining facilities served up special holiday meals in celebration of the Army’s 243rd birthday June 14. 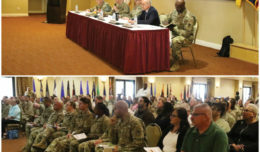 Flags and streamers adorned DFAC #2 at the National Training Center June 14 as Fort Irwin celebrated the Army’s 243rd birthday.